Sperry has select sale for up to 50% off. Take an extra 30% off with promo code "SAVE30". Shipping is free. Deal ends 3/24. Sperry has select sneakers for $29.99. Shipping is free. Deal ends 3/17. Sperry has Extra 30% Off on Sale Styles with code "SAVE30". Shipping is free. Sperry has select men's and women's boat shoes for $54.99 with promo code "BOAT54". Shipping is free. Sperry has a few promo codes available that seem to stack. FRL-MT3-P6C-BGV has been around for a while and takes 20% off. MHG-DVK-K3F-QG9 is a new one I just found and seems to take 25% off. This worked for me on desktop. I tried mobile but did not allow both codes to stack. Sperry has stackable coupon codes. 20% Off with code "MHG-DVK-K3F-QG9". Plus extra 20% Off with code "FRL-MT3-P6C-BGV". Shipping is free. Use code FRL-MT3-P6C-BGV to take 20% off select items. Final sale for outlet items. Shipping is free. Once you apply to code to something in cart, then hit the back button you will see all of the shoes that the 20% will apply to. Today only, Sperry discounts a selection of its men's and women's shoes to $29.99 via coupon code "SNEAKSALE". Plus, all orders receive free shipping. That's a savings of up to $45 off list price. 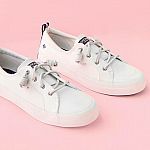 Sperry has Men's and Women's sneakers for $29.99 with promo code "SNEAKSALE". Shipping is free. Deal ends TODAY. Sperry offers its Sperry Men's Leeward Mini Lug Chukka Boots in several colors (Tan pictured) for $39.99. Coupon code "OUTLET20" cuts that to $31.99. With free shipping, that's the lowest price we could find by $31. They're available in sizes 7 to 13. Deal ends January 27. Sperry has Extra 20% Off on Outlet Styles with code "OUTLET20". Shipping is free. Sperry has Up to 50% Off Sale. Plus extra 20% off with code "SALEFINDS". Shipping is free. Sperry has select sale boots for extra 40% off with promo code "SWEETDEAL". Shipping is free. Sperry offers its Sperry Men's Gamefish 3-Eye Knit Boat Shoes in Linen for $38.99 with free shipping. That's the lowest price we could find for any color by $36. They're available in most sizes from 7 8 to 15. Note: They're also available in Dark Tan for $40.99 with free shipping. Sperry offers its Sperry Men's Gamefish 3-Eye Knit Boat Shoes in Linen for $38.99 with free shipping. That's the lowest price we could find for any color by $36. They're available in most sizes from 7 to 15. Sperry has select items on sale saving up to 65% off. Shipping is free. Sperry has select sneaks for $39.99 with code "SNEAKERS". Shipping is free.